As stated recently, part of my reading plan this year is to look at a number of different views of Jesus. Vermes is an author that I’ve been longing to read for some time. A renowned expert on the Dead Sea Scrolls, he trained as a catholic priest before abandoning his faith and turning to a life of academia. Subtitled ‘An historian’s reading of the Gospels’, this was the first of a trilogy of books that Vermes wrote on the figure of Jesus, releasing one every 10 years. The opening premise is that Jesus is neither the Christ of christianity nor the heretic of Judaism but something in between the two. With this, we may get a sense of the flavour of what might come, as it is a critical look at christianity and its origins, but which is quite learned, not falling into the silly denialism of the Christ Myth theory, which holds as much as weight as creationism or climate change denial. Vermes starts with a look at the Jesus that the gospel writers want us to believe in. In other words, he looks at the prima facie case and critiques this before looking at the background setting. It’s not the approach I was expecting, but it makes for a very interesting, if painful reading. I say ‘painful’ because it is a most excoriating work which, if read with the due seriousness and respect it deserves, is enough to shake anyone who professes faith in Jesus, nomatter how conservative or liberal their take is. It is a far more insightful critique than many that are commonly regurgitated. I would thoroughly recommend that anyone interested in christianity, either for or against it, have a read as well as think about the questions raised. Many may well be answerable, but Vermes doesn’t offer us a counter-case here. That is left for others. After this opening, he then looks at Jesus as a Galilean. i.e. what was the culture in which he existed? This is where Vermes the historian comes to the fore. Almost anyone who has heard of Vermes will probably associate his name with the Dead Sea Scrolls. It is from here that he draws most of his source material, though he doesn’t apply the same level of scepticism to the Scrolls as he does to the gospels. I shan’t recount the details here. I shall merely say that it is written with great care, in an accessible manner and with a combination of depth and breadth to enable the reader to get a grip on the time and place – an understanding that is rather lacking in some christian quarters as well as some atheist. A similar kind of picture is, I am led to understand, in E.P. Sanders’ Paul and Palestinian Judaism (focusing more on the latter part of the title than the first). Having painted the background, there are some other figures that Vermes wants to bring into the picture to show that Jesus was far from unique. Labelled as “charismatic Judaism”, Vermes again draws on the Dead Sea Scrolls as well as various bits of rabbinic tradition. So while I would expect anyone reading this review to be familiar with the figure of Simon bar Kokhba and his revolt, there are others here that we meet who are far less familiar. I certainly admit that I knew very little about Hanina ben Dosa or Honi the Circle-Drawer. The overt intention is to show the kind of charismatic figures that were known in the area at the time, though the intended subtext seems to be to show that there was nothing special about Jesus; that he was just another charismatic preacher and healer. A couple of interesting points to note: As stated in an earlier piece, my intention is to do a bit more reading around Jesus this year. One thing that Vermes states clearly is that there have been some who think Jesus was a Zealot. This is an opinion that Vermes rejects, saying it has no basis, but he doesn’t explore the possibility in too much detail. So I look forward to reading more about that in Reza Aslan’s recent book on the subject. The other thing is that while Vermes largely follows in the footsteps of Bultmann in supposing that the sources we have for Jesus are more indicative of the beliefs of the early church than an accurate portrayal, he doesn’t address the question of why the church believed what they believed. It is that question that Bart Ehrman takes up in his recent work, How Jesus Became God, which is the next major book on Jesus I’ll be reviewing this year. The second half of the book is focused on the various titles of Jesus. Specifically, the titles of ‘prophet’, ‘lord’, ‘Messiah’, ‘Son of Man’ and ‘Son of God’. By far, the most focus here is on the title ‘Son of Man’ which is appropriate, as this is the most common appellation given to Jesus by the gospel authors. The normal view of this title is that it harks back to Daniel 7. However, Vermes is eager to avoid the possibility of this, given the christological implications that that would have. The great irony here is that early in the book Vermes draws a dichotomy between a conservative and a supposedly progressive view (the latter he attributes to Rudolph Bultmann), arguing that the progressive view is quite uncomplicated whereas the conservative view has to jump through all sorts of hoops, with some tortuous reasoning. Yet Vermes employs these kinds of techniques in order to distance the Son of Man of the gospels from the Son of Man in the gospels. One of the problems with the methodology implicit in Vermes’ work is the assumption that Jesus could not have instigated anything new. If anything does appear to be in line with the early church teaching it assumed to be a back projection on the part of the gospel writers and subsequent editors, while the idea that it could possibly be genuine is ruled out. At the same time, if the gospel writers are in agreement with one another, then the assumption is that they have copied one from the other. So the idea of double attestation is hamstrung from the start. This is a feature that is not unique to Vermes’ writing. If any of you have followed The Jesus Seminar then you will see a similar methodology employed to evade the possibility of concluding that the early church had a true and fair view of who Jesus was. With all that said, the lasting legacy of the book has been valuable, as it has helped to reassert Jesus’ Jewishness, in contrast to centuries of anti-Semitism that have existed within both the christian and Catholic churches. This is largely helped the more modern scholars such as N.T. Wright, Kenneth Bailey, Richard Bauckham and James Dunn see Jesus as both a key figure marking the culmination of Judaism and the start of christianity, but also as a figure of continuity between the two. It is a complex side to Jesus’ identity, but one that this reader thinks is necessary to grasp if one is to get a firm grip on this figure that so many have tried to mould into the image they like. Vermes was not innocent of this, but his contribution, though disturbing at times and at others contestable, is one that has much value and continues to be worth considering. Here I will make a few comments on each of the parties standing in my constituency. Consequently, I will not be making extensive comment on any of the regionalist/nationalist or minor parties that I cannot vote for. I shall deal with them in the order of the size of their current parliamentary parties. I am not a natural conservative and have been highly critical of the evils perpetrated under the current leadership. They try to make much of their economic record with buzzphrases such as the “the mess we inherited” and “our long term economic plan”. What they fail to ever mention is that they inherited a recovering economy. Not only that, but they have been consistently dishonest in their appraisal of the causes, only attributing it to the previous Labour administration, failing to mention that the Conservatives supported Labour in the bail out of the banks, the single act that pushed up the deficit and increased the debt. Still further, as any reasonably educated and economically literate person could tell you, the causes of the banking crash was a lack of regulation and oversight, sparked by the deregulation of the markets in the late 80s. Successive governments, Tory and Labour, oversaw the growing problem, with ineffective regulation, though it was always the Tories who called for less and less regulation. In the last 5 years, the coalition’s economic record can be summed up by the fact that nearly a million people have had to use foodbanks between 2013 & 2014. Their attacks on the disabled have been, and I do not use the word flippantly or in ignorance of its implication, immoral. With this being a safe Labour seat, the Conservative candidate is something of a sacrificial lamb. The fact that she put herself forward for selection must have come to a great relief to the local party that someone had bitten this particular bullet. Her main campaign thus far has been a mixture of parroting the party line and having a petition against the ridiculous management of London Bridge station, where many of the residents of the constituency commute through. I am led to understand that she has not been well lately, so most of the campaigning has been done by the local party on her behalf. I hope she recovers to good health soon. I have voted for Labour in the past, but I did not in the last elections to be held, the European elections. Part of the reason for that is that is the different electoral process there. You may recall that I am no great fan of the first past the post system. But for a general election, it’s what we’re stuck with, not least due to Labour’s campaigning against the introduction of a more democratic method. This means we remain with voters having to consider tactical voting. My biggest concern is that Labour are just too far to the political right and as such are almost indistinguishable from the Conservatives. When looking at what a Labour cabinet might look like, one has to assume that the current shadow cabinet will, by and large, be the cabinet of government. I have particular issues with some of the cabinet. For example, I still do not find Ed Balls to be a credible candidate for chancellor; Margaret Hodge would be a far better candidate. When it comes to education, Tristram Hunt just seems as though he is in the wrong party, just as Robert Halfon’s campaigning for the disabled has been most un-Conservative like. The recent comments by Rachel Reeves to the effect that Labour are not the party of the unemployed does little to make me think that her ideology is vastly different from that of Iain Duncan Smith – probably the most heartless person on the Conservative front bench. I have also heard very little about reversing the damage the current government has inflicted. So while they make a lot of noise about the NHS, they do not go far enough by way of banning the privatisation of the NHS or repealing the Health and Social Care Bill. The incumbent MP, a former minister, is stepping down this election. Her successor has been curiously quiet. The most notable campaign has been one about the overcrowding at London Bridge, in parallel (but seemingly not in cooperation) with the Tory candidate. Secondary to this has been about the small businesses based in railway arches, particularly those near Herne Hill and Brixton stations. As yet, though, my only encounter with a Labour activist in the area was a gentle door-to-door enquiry when the gentleman couldn’t remember the candidate’s name. The Lib Dems are another party I have voted for in the past. Not the recent past, I might add. For whatever they may claim they stand for, they are tainted by the Faustian pact they entered into 5 years ago. They have, though, been behind some of the better measures made by the coalition, such as increasing the personal allowance. As the minor part of a coalition government, it was almost inevitable that they would make compromises. The question to consider is whether those compromises were reasonable or whether the Lib Dems violated their principles in order to ensure they occupied, if not the corridors of power, the broom cupboards that lie just off the corridors. Their biggest own goal was to back the Conservative’s plans to make higher education unaffordable for many, in spite of having promised to not raise tuition fees. Because of this, it seems meaningless to ask what their policies are, as their voting patterns will be dictated to them by whoever they may end up in coalition with, if they even retain a large enough parliamentary party to be the kingmakers as they were in 2010. The last projection I saw had them down to 17 MPS, making them the 4th largest party, behind the SNP. The Lib Dem candidate has climbed the ladder through local politics and is by far the most recognisable of the candidates, having been a local councillor. He was also the first to get his leaflets through the door. This, though was where they lost any chance of my vote. 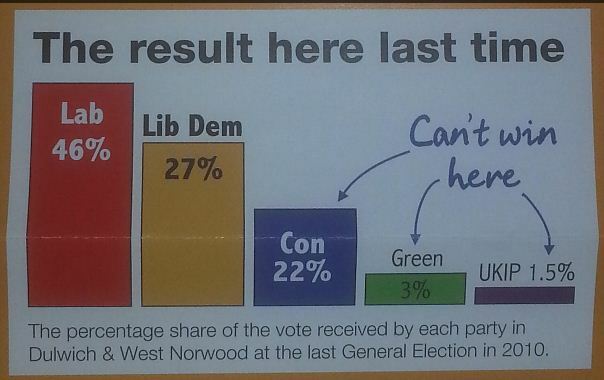 There was a misleading graph on the front of the leaflet which exaggerated the Lib Dem share of the vote. This was a dishonest measure and when I confronted the candidate about it, he failed to acknowledge that it was wrong, trying to somehow argue that to graphically represent the share of the votes fairly would be misleading. I will not vote for a candidate that seeks to mislead the electorate. Where does one start with UKIP? From one perspective, their recent increase in popularity (due in no small part to the exposure afforded to them by the BBC, Daily Mail and other bastions of the right wing media) is quite interesting, but in many aspects it is also deeply worrying. Their rhetoric of hatred directed at the migrant population, blaming all the countries ills on the European Union, is built upon a paranoid delusion. The rate of embarrassments they have had over the racism of members, their cavalier attitude towards to expenses and their whole far-right ethos go completely against what I, and many others, see as good about British values of multiculturalism, tolerance and reasonableness. I heard nothing from the local candidate. Just as the electorate here are too intelligent and well-informed to vote en masse for the Conservatives it seems highly unlikely that UKIP be a significant force here. At the European elections, their poster in the area was defaced with an message saying that their politics of division and fear was not welcome here. I have for some time been more inclined to the Greens than any other party. As a scientifically educated person, though, I do not agree with their objection to nuclear power. Their lone MP, Caroline Lucas, is one of the few members of Parliament who is genuinely deserving of the title “honourable”. She has consistently spoken good sense in the Commons and been a thorn in the side of the coalition. Natalie Bennett, though, has had a massive crisis of credibility lately. It began with an interview on the Daily Politics which was followed up with an infamous radio interview when she came completely unstuck over some rather gentle questioning on their economic policy. I regard their “citizens’ income” policy as nuts and any time they have been given an opportunity to explain how it will be funded they have completely failed to do so. The local candidate is the biggest reason to not vote for them. For starters, he doesn’t seem to be very aware of where the constituency is. His rhetoric is nearly all based around Brixton. Yet only a tiny bit of the constituency is in Brixton; furthermore, only a tiny bit of Brixton is in the constituency. One of the puzzles is that if they really are a trade unionist party, why is it that the trade unions, on the whole, back the Labour party and not TUSC? That’s a question I don’t know the answer to. I could speculate, but that will be of little help. Reading through their policies, it is clear that they are a left wing party and probably most aligned with my own thinking. While my own manifesto was (and I hope it was clear) a sketch, theirs seems even more simplistic. For example their entire tax policy is “Tax the rich. For progressive tax on rich corporations and individuals and an end to tax avoidance.” – there are no proposals as to how this will be done, how much it will raise or even what thresholds will be used to determine “rich”. The local candidate comes across as the antithesis of a typical politician. In this respect, he very much like the other left-of-centre candidate, the Green Party’s candidate. He is clearly a passionate man who has put himself up for election more because of what he believes and less because of party loyalty. This makes him quite different from the other candidates, where I think the weightings of the motivations may be quite different. I do not believe he stands a real chance of being elected, but I am tempted to vote for him, if only so that he does not lose his deposit. After enunciating those thoughts, am I any closer to a decision? Closer, certainly; decided, no. 1) Have good policies. Without these, you’re a non starter. They must be well thought through, overall financially viable (allowing that some areas will be net spends and others net gains, e.g. funding the spending of the NHS through taxation) and must leave no group left behind. See my voter’s manifesto (links above) for what I consider to be “good”. Others will differ to a greater or lesser extent. 2) Spend more effort speaking about your own policies than you do of others. There is nothing more offputting than trying to portray your cause as the only viable one, dismissing all other alternatives as “chaos”. As a corollary to this, I would also ask that you not make promises on behalf of another. By all means, critique a manifesto promise that one of your opponents has made or point out failures to meet promises, but do not make assumptions about what another party will do unless they have stated it. It makes you look as though you lack the conviction to back your own policies and are relying on voters to make you the default option of “not them”. 3) Don’t be a sycophant. Anyone who wholeheartedly and uncritically supports every policy of their own party is a person who falls into one of two categories: a) the gullible, believing everything they hear with a slavish devotion to the party line; or b) the dishonest, who advocate views they do not hold for fear of seeming to be disloyal. The former is a fool whose opinion is valueless as it is swayed and tossed by the wind, devoid of a firm foundation. The latter is a schemer who cannot be trusted as it impossible to tell what they truly believe and what they are saying because it serves an ulterior motive. It’s fair to say that this is a book with a bit of reputation. A reputation, that is, for being one of the finest books ever written. Certainly one of the best American works of fiction and a contender for holding the mythical title “The great American novel”. So it’s fair to say I approached with in an air of expectation. I wanted it to be good, I wanted to leave me thinking “wow”. I wanted to be able Hunter S Thompson’s obsession with it that made him type it out just so he could experience what it felt like to sit and write a great book. Such approaches almost always end in disappointment. Too many times there have been books (particularly fiction) that have been hyped up, even whipped up into a kind of literary frenzy that one cannot help but be underwhelmed by it. Examples include David Mitchell’s Cloud Atlas, Salman Rushdie’s Midnight’s Children and Yann Martel’s Life of Pi. So, in contrast, while the praise of others led me to expect a great book my own experience led me to expect a let-down. So which was it? The fact is, it was neither. It is fair to say that it didn’t love up to the hype but it wa far from being a bad book. It was really quite captivating and, being rather short, I finished it all too quickly. The story is told in the first person from the perspective of Nick, though the identity of the narrator is actually of marginal consequence. It’s quite interesting that of the recent American fiction I’ve read, lots seem to be told in the first person. Other examples include H.P. Lovecraft’s short stories, On The Road and To Kill A Mockingbird. I couldn’t help but wonder if this was in some way indicative of an individualistic mindset and the longing for a “hero” figure, the motivation behind the majority of comics – a genre in which I have little to no interest, but whose influence seeps into much of 21st century western culture. The figure that is of interest is the eponymous Gatsby. He is introduced to us in a manner not wholly dissimilar to Boo Radley in the aforementioned comparison. Though if anything, Harper Lee may have been influenced by The Great Gatsby, not the other way round. But it was an interesting plot device to note. He appears as a shadowy figure, then as one about whom various rumours are told, but no one knows what is really true. Eventually, he steps out into the light and we get to hear his voice, even if the various pieces of his life don’t seem to fit together properly. Is he a rich hedonist on the verge of self-destruction, a German WW1 fghter trying to make a new life for himself, an Oxford don or something else entirely? One of the book’s strengths is its sense of time and place. Set mostly in the fictional borough of West Egg of New York, the reader is firmly impressed with the decadence of the age, coupled with the mob threat that lurks in the heart of the city, but which this outer borough is largely free from. As the story progresses, the friendship between Nick and Gatsby grows, but other interactions are rather distracting for Gatsby who becomes increasingly obsessive and he begins to alienate others in his quest for Daisy, who he once knew years earlier, but where the circumstances of that encounter I shan’t spoil for you. The book has rather a bewildering conclusion. I had to re-read it several times to try to work out what had happened. Again, I shan’t spoil it for you, but it is intended to be a dramatic finale, but what exactly happens to whom is hazy at best, so that while you think one thing has happened, a couple of pages later you find out something else has happened or a character you didn’t think was mixed up in it suddenly was. This rather marred it for me, as the need to go back a few pages is, to me, an indicator of poor writing, not of great storytelling. As I read through it, I though that it would make a great filling in a trio of works that progress through the ages and cultures. So if you are going to read this, and I would recommend that you do, I would do so after The Forsyte Saga and before On The Road. It provides a wonderful link and the together make for a fascinating journey from the English aristocracy to the American beat generation. I wouldn’t deny that it’s a really good novel, though I struggle to see why it evoked the reaction it did in Thompson. Perhaps it is one that I ought to return to sometime in the future. Continuing my adventure in Chelsea, I made my way to John Sandoe. Pretty much in the heart of Chelsea, it’s housed in what appears a slightly wonky building; one where the beams are visible but where no two of them are quite parallel with one another and where any single beam is not truly straight. As you walk in, you find the floor is also a bit higgledy piggledy. There’s no obvious place to go so I just headed for the nearest shelf and had a look at what was in front of my face. There was no clear order to the books on display. They weren’t grouped by fiction/non-fiction or any subcategory thereof. They were just there. So you had to look quite carefully to see what might take your fancy. As I explored a bit I did eventually discern that there were patches around the shop where the books were grouped by publisher. So I found a whole load of Persephone books (see earlier), a wonderful array of Very Short Introductions and a bunch of P.G. Wodehouse stories. It all had a delightful charm to it. It wasn’t shambolic in its organisation as I had found with Bookmongers and Skoob, but neither was it so neatly laid out that you could find what you are looking for with minimal thought; the opportunity for adventure and accidental discovery is a permanent presence at John Sandoe. I didn’t think the shop was terribly large, though I had been intrigued by a few very narrow staircases, yet they seemed so narrow as to be slightly foreboding. I hadn’t seen anyone go up or down them so I thought it might lead to an office or a personal dwelling. It wasn’t until someone came in, asked for the children’s section and were directed downstairs that I realised that there was more to the shop. So I ventured upstairs and found a great wealth of books which I could spend many an hour perusing. But I have to tell you about the genius shelving. While there were fixed shelves, they had an attachment to the front that allowed for sliding panels, each panel being a shelf in itself, so they were able to stack books three level deep, but you could just slide one panel out of the way to get to the one behind, so it was non-obstructive and an utter delight. While up here I found was may have passed for the religion section, though it had plenty of other bits mixed in. I was very tempted by Strange Glory, the new biography of Dietrich Bonhoeffer by Charles Marsh. Though it just didn’t quite seem right for this bookshop. Being in Chelsea, I wanted to get something that had a certain air of poshness to it. So I had a quick look on Wikipedia to see a list of stories by an author I have long been implored to read and see what was the first full novel in their most famous series. Returning to the Charing Cross Road, I wanted to see a couple more of the one-off shops that I didn’t get a chance to go into before. Walking into Any Amount of Books, I was immediately caught by the Hardy novels that were just at eye level on the right hand side as I walked in. I think they had just about every published work there, including the few that I haven’t read. These were sat amongst some very good value 2nd hand books, reasonably well laid out. For a very small inside shop area, there were quite a few people there when I visited. So there was a bit of jostling about to get position to look at the shelf you wanted; it’s a game I wasn’t too good at and had to pretend to look at some shelves when I wasn’t interested in them, just while I waited for someone to move. The christianity books were listed under “Myths/Legends” which didn’t impress me much. Though it may have appealed to one other shopper who came in asking about books on angels. Eavesdropping the conversation with the staff a little, I gathered that such books are quite popular, though it was not specified what religion, tradition or philosophy was being sought. There was another sign in the shop that irked me rather. It was I’d seen before, when I was in Judd Books. It was the sign that said no bags were allowed downstairs. So I was quarantined on the ground floor again. But I couldn’t get Jim Crace’s Quarantine for a second time, could I? No. I was torn. There were some great 2nd hand books on offer here, many of which I’d heard of but hadn’t seen on sale before. So in that respect I loved it. But banning people from going downstairs with bags is stupid and unwelcoming. So in that respect I hated it. What book had I seen that could encapsulate feelings that mix both warmth and coldness in my attitude to the shop. Well, there was one, though the biblical reference may have been lost on the shopkeeper. There was one more bookshop on Charing Cross Road I felt I had to visit. Henry Pordes has a slightly odd look from the front. It’s not particularly neat but neither is it so higgledy piggledy that it acquires charm. It just looks a bit unloved. As you walk in, it’s a bit TARDIS like. You might get the impression from the outside that it’s the same size as Any Amount of Books, but in fact it’s quite a bit larger, as the shop goes back more than 10 feet. It’s not clear what the ordering was supposed to be. A fairly big alcove to the right contained a lot of oversized hardbacks, mostly on fairly run-of-the-mill history, quite a bit of which was military. This is really not my area of interest so I searched for some time for anything that could be a contender for a book to buy. One of the interesting features was the height of the shelves, as some were unreasonably tall and you need a ladder just to read the spines. The staff were all rather sour-faced and when I did eventually make my purchase the chap on the till gave a rather disdainful look for a reason that I have yet to fathom. I did evetually find a section of the shop that took my fancy, as it had some more ancient history as well as science here. I didn’t find any sign of a religion section in the shop, which was rather disappointing. For those books that weren’t signed first editions, they were reasonably priced, often about 2/3rds of the RRP that is printed on the cover. Having not picked up too many science books on my travels thus far, I concentrated in this area. The one that jumped out as me was a book by an author I have yet to read, though his reputation in physics is mighty indeed and who I think bears more than a passing resemblence to Dominic West. So I come to my final bookshop of my pilgrimage. I knew this one was in Peckham, but it was a part of Peckham I’d not been to before. I am used to the main road, which is always dirty, with rubbish strewn everywhere. Review is just 100 yards or so from here, yet it is almost half a world away in a much more gentrified part of Peckham. It has the nice touch of being one of those shops with a bell that rings as you enter. Plushly carpeted, it’s one of the nicest underfoot of all the bookshops I visited. The place has clearly been done up fairly recently, though the ceiling still betrays the slightly more shabby start in life that the shop must have had. There is a fairly open part of the shop with a few displays before you get to the back where most of their books are kept more densely. One of the charms of the shop was the idiosyncratic labels that were used to describe the various sections. Unfortunately, the non-fiction offerings were a bit scant, especially in science and religion. So it felt most appropriate to go for a fiction work. Of these, there was a reasonable collection, though there was little here that jumped out at me. The ones that did, other than the one I chose, were Muriel Spark’s The Ballad of Peckham Rye and The Book Thief by Markus Zusak. With that, I end my tour. There are many more bookshops around London that haven’t even got a look in here. I f you want some sort of conclusion, it will have to be that it was great fun doing the exploration and partially made up for my bank screwing me around, denying me my first overseas holiday in 5 years. I hadn’t yet gone over to what is sometimes referred to as the East End, though in reality this is north-east London, not far from Liverpool Street station. I approached Brick Lane from its south end, which is a little awkward as the first 20 yards or so go by a different name, so if you are looking for a sign that says “Brick Lane” you will get hopelessly lost. As it is reputed, the place is full of character and curry houses. The book shop is quite some way up the road, maybe a good 10 minutes’ walk or so, on your right hand side and you head north. At the time I got there, the place was fairly bustling which, given it’s not the largest of shops, made it quite hard to move around. We had to squeeze past one another and a couple of nattering schoolchildren made part of the shop inaccessible for some time. Almost opposite the till, just off to one side, was a fantastic wall full of Wordworth Classics and works of Shakespeare. They also had a fairly solid collection of modern and children’s fiction. I must say I was a bit disappointed at first by their non-fiction offerings, as this seemed to be limited to just a single bookcase that was not organised by any discernible categories. However, it was somewhat redeemed by a wealth of offerings on local history. That is, local to north-east London. So I was torn about how to sum up the shop in terms of my purchase. On the one hand, it would be quite reasonable to go for a Wordsworth Classic, but on the other, I had the chance for an insight into a locality I might not get elsewhere. I think I made the right choice. Billed as London’s largest anarchist bookshop, one could be forgiven for missing it. As far as the ‘alternative politics’ bookshops (c.f. Housmans and Bookmarks above) this is certainly far more anarchist in feel and less communist. The address gives the impression that is on the high street but it is in fact down an alleyway which is next to an outlet of KFC. As with Bookmongers, this is a shop that comes with its own dog. This time, it was (I think) an English bull terrier. Small, white and basically a ball of muscle, it was very pleased to see me, but wasn’t in any way obtrusive. The woman who was running the shop was just putting a small bookshelf outside (as it was a sunny day) and said that I was the first customer of the day, in spite of the fact that it was gone 11 o’clock. I had a good mosey round. One shelf that caught my eye was the fiction and I noted that there were a few works there by Ursula Le Guin. Now I’ve had her on my radar for a little while now but haven’t got round to either reading or buying anything by her, so I was very tempted by a copy of The Dispossessed. However, Freedom is not just a bookshop. It is also a publisher in its own right, so in trying to buy a book that summed up the place, it seemed more appropriate to pick something from the in-house publishing label. The works on offer here are nothing like what you would expect to find in a Waterstones. So it took some time to flick through the titles, which only served to highlight how uneducated I am in matters relating to the anarchist movement. There were strong critiques and polemics here against not only Conservatives, but also plenty of ire directed towards Labour. The one thing that put me off somewhat was the alignment with libertarians, as my experience of those who describe themselves as such are mere Conservatives whose love of liberty extends only so far as advocacy of their ability to economically oppress others. As a prime example, I might cite the arch-irrationalist Christopher Snowdon. Nevertheless, even if I disagree with a position, I must learn from it. So I look forward to learning more about the school of thought which gives rise to such a place as this. The floor may be bare, hard and cold, but the welcome was warm and open. As I walked out, it was pointed out to me that there was a box of old magazines on a table and that they were being given away free. So I picked up on my way out as a bit of a bonus. It’s called Lobster magazine. I had no intention to visit the Whitechapel Gallery but I noticed it had a bookshop which was just a few feet from Freedom (above) so I popped in for a bit. Interestingly, the price tag on the book I stated that this was an outlet of Koenig Books, which I know as a specialist art shop on the Charing Cross Road; a shop I hadn’t planned on visiting in my travels. Being an art bookshop, there were plenty of oversized picture books that pretentious people like to think are higher form of culture than those they enjoyed when they were four years old, but which are ultimately just oversized picture books. These hold no interest for me whatsoever, so I was rather restricted in what I might choose. One of the other noticeable features of the bookshop was that while in most, you would have people observing the unwritten rules of allowing other people past, the Whitechapel Gallery shop was seemingly populated by scarecrows. The clientele tended to pick their spot and stay rooted there, oblivious to anyone else and not moving, even to the extent of ignoring others when asked to shuffle just a few inches. So when I spied a shelf that held some interest, I was obstructed by one chap who seemed to think it was a strange library where you had to stand rigidly in front of the books and read pages and pages of a single work. This made it rather difficult to get to so I had to be patient, circling back every now and then to see if he had picked up my hints that I wanted him to stop obstructing the interesting-looking shelves. It would only have required him to take a single step backwards, but the white-trousered man remained. It took a good 10 minutes before he finally shuffled his feet slightly and allowed me to reach around him and pick up a couple of books of interest. One was seemingly a work of sociology or politics asking why we need to grow up (hence my comments about the juvenile appeal to picture books above) and one was a Very Short Introducton to Art Theory. Since this was an art gallery bookshop, the choice was obvious, wasn’t it? Leaving the East End, I jumped on the District Line and a couple of miles over to Belgravia/Chelsea to explore a couple of shops down that way. Belgravia Books was one that had been highly recommended to me and so I approached it with some level of anticipation. It was another shop that was said to host a canine friend, though none was visible at the time I visited. In fact, there was very little going on when I visited as I was the only customer in the shop for most of the time, apart from when one chap came in asking where there was a nearby French restaurant as he’d arranged to meet someone there but hadn’t had the foresight to note down the name. When it comes to considering bookshops on a scale of neat & tidy to messy & characterful this one definitely ticks the neat box. It’s very professionally laid out for a relatively small space. There was a generally good selection of both fiction and non-fiction, though I would say that the religion section was rather lacking. However, I was very tempted by a couple of maths books they had which I hadn’t seen anywhere else. But they had something here I had seen surprisingly infrequently in other bookshops: a recommended list. They had selected some titles and laid these out especially. As my aim was to buy a book that typified a bookshop, it seemed only reasonable to opt for something the staff here had recommended to their customers over and above all the other titles they had in stock. Some I had read, some I own but have yet to read. But there was one that grabbed my attention, not as a “you must buy me” but as a “you need to take a closer look at me, for I intrigue you”. I first noted Persephone around Christmas when I was with family, having planned a day at the British Museum, they got bored within an hour and wanted to spend half the day in Argos. But the route took us down a pedestrianised street where Persephone books is situated. I wasn’t able to go in then, so it wasn’t until my “holiday” in late February that I was able to get past the front door. It was a door with an old fashioned bell attached to it, making sure that everyone inside knew that you had arrived. Persephone is a publishing label which mostly operates by mail order; this is, to the best of my knowledge, their only store. As soon as you walk in, you get the impression this isn’t a regular bookshop. There were very few books on the shelf and they were all in the Persephone design, which is a fairly plain (some might say dull) grey cover with a single white box containing the title and the name of the author, with a small black company logo near the bottom of the cover. What is different about each one is the design inside the cover, which are all rather exuberant but charming. The other main feature of the very small shop area was the boxes containing lots more books that weren’t on display. I couldn’t call it ramshackle, because what was displayed was very well done. It’s just that there was plenty of other things going on at the same time. For example, as I picked the volume that looked perfect for me, the phone rang and I heard one side of all too familiar conversation – that between a cold caller (NPower, if I recall correctly) and someone who couldn’t wait for the conversation to end, but who ran down a couple of dead ends before being able to end it. I must say that the staff here were amazingly friendly and so it’s worth visiting just for their brief company. I did sketch my reasons for being there, as they handed me a catalogue, though one of the staff, while expressing delight at the prospect of visiting bookshops in your time off, thought there was such a thing as “too many books”. I had to voice my disagreement as I left there, having paid, with one more. It took a little while, but I finally made it to one of the most highly recommended bookshops of the lot. On walking in, I was greeted to a gentle but bustiling noise of a cafe that adjoined the bookshop. I didn’t make it as far as the cafe which I slightly regret. Instead, I headed straight for the shelves which were very well stocked and laid out, with all sorts of fiction upstairs. There were some on tables in displays that reminded me of the more professional bookshops like Waterstones or Foyles. Somehow this idea was reinforced by the particularly posh accent of the shopkeeper. Heading downstairs where they kept their poetry, plays and non-fiction, I sort of felt I was intruding. The area was not huge, but it was sort of a pit with a table in the middle and a few chairs around it. Only when I was there, there was some kind of planning meeting going on so while I edged around trying to look at books, I couldn’t help but be distracted by the rather entertaining conversation that was going on. It would be wrong to divulge the contents here as I didn’t get consent, but if anyone from the shop recongises this scenario and remember a chap in a black denim jacket trying to move around without getting in the way, then that was me. The religion section wasn’t well stocked, which was a bit disappointing. If it had been as strong as their philosophy section, then I would have been a bit happier. However, I was drawn to the science and nature section, where these two were merged and no great subject divisions were clear. Having been confined to the city where I live (but am still none too fond of) I must admit that I was aching rather to get outside to the country where there is freedom to roam and one can breathe fresh air. Being in this cauldron of a basement only exacerbated that feeling, so I felt I had to opt for a book that encapsulated the desire to, as Freddie Mercury might put it, break free. In an effort to sample the bookshops of London, I couldn’t just stay in the centre. So it was that I headed off to Gipsy Hill, the area of south London that is host to The Bookseller Crow. It’s not easy to get to, particularly from my home in East Dulwich. I had to get a bus down to Crystal Palace (about 20-25 mins) and then walk from there (about another 20-25 mins). While it’s not a huge effort compared to many journeys, it probably embodied the idea of pilgrimage better than any other journey I made. It is for this reason that I was so disappointed at what a let down the bookshop was. It reminded me somewhat of Dulwich Books (see interlude). The fiction was, as expected, the dominant force at play, with a fair selection of children’s books on offer. Yet the science section was paltry and what passed as “spirituality” consisted of one shelf of Neale Donald Walsh and, for reasons unfathomable, Bradshaw’s Guide. The main redeeming feature was that it seemed to host some worthwhile events. I noticed that fairly soon they were going to have an evening with Jessie Burton, author of The Miniaturist, which I had bought at Primrose Hill. Having puffed my lungs a bit walking up some small hills, indicative of my current lack of fitness, I thought that it would be good to try to get a book that had some sense of a journey about, particularly one on foot. After leaving the Bookseller Crow, I had a couple of disappointments (see the interlude) so I tried to make up for it by going over to Westminster and visiting what will be my new local bookshop once my office moves in a few months’ time. The Church House Bookshop is just a few yards from Westminster Abbey, in what is something of a different world from that which most people in the country live in for most of the time. As I got there, I passed tourists who were trying to get a glimpse of Big Ben and various (presumably) civil servants carrying small folders of paper around and scurrying with a Kafka-esque sense of urgency to get somewhere to do something that no one understands and which seemingly makes little difference to 99% of the population. To step into the bookshop, then, it is to take a step back from this madness and gather some moments of peace. I had not been here before, though they did do a pop-up shop at Greenbelt [include link] which I greatly enjoyed. I was greeted with a hushed “hello” as I walked in, instantly getting the impression that this had quite a library-like atmosphere (is librarial a word? If not, it should be). With hard floors and no background noise or music, one feels as though one must tiptoe around so as to not make a sound. It is certainly professionally laid out, with different topics clearly marked and with some nice displays on the tables. For what is ostensibly an Anglican bookshop, I was not surprised at a dirth of nonconformist writings, though I wasn’t expecting quite so much here that was pro catholic and eastern orthodox. I had a good mosey round the place, finding all sorts of wonderful books thinking “I must read that sometime” at least twice on every shelf I passed. So it was something of a struggle to choose the one book that I thought would epitomise this place. In the end, I made a conscious decision to opt for an element of tokenism, as I’m aware that the vast majority of my books on christianity are by men. I need to try to even things up a bit. Well, that cut down my selection somewhat, but I still need further direction. Much of what I have in my “to read” pile is either testimonial in nature of historical. So it would be good to get something that spoke to the here and now, to the humdrum, to the boring people like me who just try to get on with life, living as a christian in a country whose multifaceted identity can at one moment seem to have a rich christian heritage, but in the next can seem a world apart from many an expression of faith. This was one of the first places I tried to visit. It’s located underneath Waterloo Bridge on the south side of the river. Or rather, it’s supposed to be. The only evidence of it was a lonely blue sign stuck to some railings. The website said that it happened every day come rain or shine, but it seems that this was out of date and that the book market is no more. Situated at the end of a posh row of houses in Chelsea, Bookhaus was a strange one. There was a clear sign that said “Open” on the door and I could see someone inside. Yet the door was locked (note, this was around 2pm). Having a locked door and being open for business are mutually incompatible. I could have stayed and knocked on the window, but if they don’t have the good sense to be accessible then they don’t deserve to have any customers. If a tourist were to ever stumble across 56a Infoshop by accident then they would be very very lost indeed. I had the independent bookshop map in my hand and still wasn’t able to find it after I aimed for it after leaving the Kennington Bookshop. I had to go back another day with an A-Z in hand in order to head down the back streets of Elephant & Castle. When I did eventually find it, it was boarded up. There was some writing on the outside that mentioned the opening times of an organic food shop, but no sign of a bookshop. Moving on from the radical, liberal 56a, one may find the Tabernacle Bookshop barely a quarter of a mile away as the crow flies. This is attached to the hugely impressive building that hosts the Metropolitan Tabernacle, the same church and building where Charles Spurgeon preached. Some months ago, I visited an FIEC church where an old friend of mine used to preach, though he and his family had since moved on. While there, I spoke to a chap about the same age as me who had been to the Tabernacle bookshop, describing it as behind a thick curtain, such that the pulling aside of it made one feel as though you were being let into an inner sanctum. To get to the bookshop, there’s a little alleyway down the side of the church and you end up in a sort of side carpark. As soon as you go down there you get the impression that you should’t be here; almost as though its an industrial estate, private property. I passed a parking spot that had a little sign above it saying it was reserved for the minister. Passing this, one gets to a sign marked “Tabernacle bookshop” which leads up to some steps to a plain door which was locked. There was a series of buzzers to the left hand side of the door, one of which was marked “bookshop” but as with BookHaus (c.f. above), if the door is locked, then the shop is not truly open for business. I was tempted to press the buzzer, if only to satisfy a sense of curiosity, but principles are principles and so I turned around and headed off. One of the places I wanted to make sure I went to was Cecil Row, something of a Diagon Alley. It’s a short, pedestrianised road, just south of the Wyndham Theatre. There are a whole series of tiny places down here, most of which aren’t big enough to swing a cat in. The only one that is is a specialist in the occult, which I am happy to give a miss. I popped into one (I forget its name) of the other shops and had a look around. Many of the volumes were unknown to me, so I had a rather good time exploring the possibilities. That said, most of them held very little interest for me. Trying to find a point of reference, I picked up a copy of Iris Murdoch’s The Sea, The Sea. I’ve not read any of her works yet, though I do have a copy of The Black Knight in one of my ‘to read’ piles. Aware that The Sea, The Sea is one of her most famous works, I considered buying it. Only then I checked the price. This shop wanted £275 for it. I was rather gobsmacked. I put it back on the shelf and tried a few random books. The cheapest I could find was £50. It seems that this was not so much a bookshop full of books that were meant to be read, but rather of books that were meant to be owned. Specifically, signed first editions. Though familiar with the laws of supply and demand from my economics and accountancy qualifications, I remain sceptical about their absolute use in valuing scarcity. For while such books may be rare, the idea that having a signature in the front inherently adds value is a nonsensical idea. The work of labour to write just about any book would take months (there are exceptions, as I know Farenheit 451 was written in just a few days) yet the scribbling of an autograph takes only seconds. I know that I could easily have walked a couple of hundred yards up the road to Foyles and got myself a copy of The Sea, The Sea for probably little more than £10. Can it really be that the addition of a squiggle of ink adds £265 to its intrinsic value? It offends me that I live in an economy where some would answer that question in the affirmative. I had made it my aim to buy a book in each shop I visited, but here I realised that that aim could not reasonably be met. Though I buy books faster than I read them, I am not merely a hoarder. I live in a season when I am blessed with the ability to buy what I intend to read yet I don’t know how long this season will last. I’ve been made unemployed before and in today’s world there is no such thing as job security. So if I am ever made redundant or my circumstances otherwise change, I will have a ready supply of things to read while I continue to look for alternative jobs. This is my local bookshop. For some reason the London Bookshop Map has this marked as a 2nd hand bookshop, but this is misleading. It is almost entirely new books, but some of them may have been in the shop for a little while. It’s wonderfully disorganised with piles of books all over the place. The religion section is not as good as it used to be, possibly because I bought quite a chunk of it and they simply haven’t been replaced. The philosophy section is probably the best, and science is also very strong here. Don’t come if you are looking for a specific title, but do come to browse and find something delightful. Not terribly far away is Rye Books. Named after the nearby Peckham Rye, this is a very small bookshop with not many books at all. They also run regular events within the shop so while there isn’t much to see upon browsing, it is often impossible to browse. The last time I went there to look around, they were doing a children’s reading party. This is very good for the children but it renders the shop unusable for everyone else. What is in their favour is that if you know precisely what book you want, you can order it and they have a next day delivery service. This regularly gets listed as one of the best local bookshops in London. The name is slightly misleading as it’s actually closer to Norwood than Dulwich. And it remains a mystery to me as to why it is afforded such accolades. It is a moderate bookshop, but I’ve never experienced anything there that really wows me. It’s very similar to The Bookseller Crow, in that it has a reasonable selection of fiction, some regular in-shop events but is very weak on non-fiction. This is the sister shop to Dulwich books. Though unlike Dulwich Books, it’s actually in Dulwich. There are two floors to it, neither of which has a large range of books, but it has a certain charm to it. It’s another one that seems indicative of the mindset that “reading = fiction” so while it is good in one genre, it lacks the breadth that would make it a truly great bookshop. This is the oldest bookshop in London and I have to say, one of my favourites. Situated on multiple floors, with some narrow corridors meaning you have to squeeze past the other shoppers, yet without it being so cramped that you can’t move, it has a layout akin to a rabbit warren. This is one of the finest bookshops of all, as you can come here either for something you’re looking for or just have a browse. The science section is downstairs and is very well stocked, as is the religion section at the end of the same quasi-corridor. The philosophy section in between the two is also loaded with many enticing volumes. I could spend all day there and not get a chance to go upstairs. There are many Waterstones branches around the place, which are all much of a muchness. Their flagship store, though, remains the one Piccadilly, just a few doors down from Hatchards (which is now owned by Waterstones). The corporate professionalism that is evident to all is, to some, a means by which all character is drained. I would disagree with that. It may not have the quirky charm of the more ramshackle shops but it has an open, fresh feel that is most welcoming and one could spend many an hour here. In fact, I have on more than one occasion.